what about Gramin Vikas Banks ? There are multiple gramin banks in different states. Would be difficult to collate data for them! What about Deautsche Bank? Is it safe to invest 5 lacks for 5 years? What about United Bank of India? From March we would carry interest rates fro all banks! I checked IDBI Bank interest rate but didn’t find FD for 366 days. The post mentions IDFC bank & not IDBI bank. Please recheck. No. The post does mention that IDBI offers highest rate at 8.25%. Please give the right details. Sorry about that and thanks for pointing out the error. I have corrected it! I have one query on investment on land . Let’s say I buy a land for (Rs 5 lakh) for investment purpose and keep it as it is and sale it after 5 years at price Rs 10 Lakh . What will be the taxation rate for the holding period of 5 years and then when I sale the land ? Thanks Amit for the quick response . I have couple of queries on PPF . 1) I have a PPF a/c on my name in SBI and another PPF a/c on my son’s name who is a minor. Can you please let me know the taxation rule/benefit I will get for both of these PPF a/cs. 2) My wife is a home maker. Will I get any additional benefit if I open a PPF a/c on my wife’s name and i deposit the money on behalf of her (say gift to her) ? 3) In one financial year if I deposit rs 2 Lakh in PPF , will I get 8.1% interest on Rs 1.5 lakh or I will get 8.1% interest on Rs 2 Lakh ? 1. You get benefit up to Rs 1.5 lakhs only as that is the limit for Sec 80C. 2. You would not get any tax benefit as the interest earned is tax free. But by having account in your wife name gives 2 benefits: a> Your PPF investment limit increase 2> The interest earned is your wife’s income and if she invests it further clubbing rule of taxation would not apply. Read: How your wife can help you save taxes? 3. The limit for deposit on PPF has been increased to Rs 1.5 Lakhs per year from Budget 2014. If you manage to deposit more than that in financial year, no interest would be paid on that. You can learn more on PPF here. THe post lists the highest FD rates. Choose which is convenient to you! Have included banks which give higher interest than SBI/ICICI as they are biggest banks in government/private sector. We would soon expand this list to include other major banks too! Really appreciate your quick response. I have few follow up queries . May I request to respond them as well ? Option 1 : Can you please tell me know the calculation how did you get Rs 82,432 interest for 10 lakh FD investment @ 8% interest rate . Also please let me know how did you get Rs 56,961 after tax deduction. Option 2 : Please tell me calculation for RD deposit also . Requesting you to tell me the above calculations for my knowledge purpose so that I can calculate them on my own in future. Option 3 : Thanks for suggesting to for “Arbitrage Mutual Fund”. But I have below query on “”Arbitrage Mutual Fund”” . a) I am unable to understand how normal mutual fund is different than “Arbitrage Mutual Fund” . b) For 1 year I should go for Growth or Dividend (Reinvestment/ Payout) option ? c) Please suggest where and how can I buy “Arbitrage Mutual Fund” ? can I buy it online on my own or I need to go some agency/bank/office to buy them ? d) Is it advisable to investment the entire 10 Lakh or do an SIP over 1 year ? I am not sure whether SIP option is available in “Arbitrage Mutual Fund” or not . e) Also please suggest me some good “Arbitrage Mutual Fund” which I should buy . You can search for any RD/FD calculator online and get your interest numbers. The tax applied is 30.9% on interest earned. There might be slight variation depending on what compounding you choose. For most banks its quarterly. a. Arbitrage Mutual Funds invest in arbitrage opportunities available in the market. Learn more at this link. b. Investing in Arbitrage Fund: Growth or Dividend Reinvestment? c. You can buy this fund as you buy any other mutual fund – online/offline or through Demat account. d. There is NO need to do SIP as this is not volatile fund. You can invest in one go. Thanks Amit for your response. As I understood arbitrage funds can be beneficial if market is too much volatile so that there is any opportunities of arbitrage. I also read about balance fund which invest both on equity(60 to 65%) and debt (35 to 40%). I would like to know your opinion on these ? How do you compare balance fund against arbitrage fund for investment for little more than 1 year. I am alaready having SBI Magnum Balanced Fund and have invested in it since last 2 years. But this is going negative for some time now . Hence I am little confused which one to go for . Arbitrage Funds DO NOT have negative returns for long periods. The worst I have seen is -0.01% return in 1 month period. So its relatively safe if you consider principal safety. Balanced funds invest in equities and hence there are chances of negative return and by the same virtue more chances of out-performance when markets outperform. I have one query. I would like to invest around Rs 10 Lakh for one year . I came to know that Bandhan bank is currently giving the highest FD interest rates of 8% for one year among all the banks . It also offers same 8% interest rates for RD for 1 year . 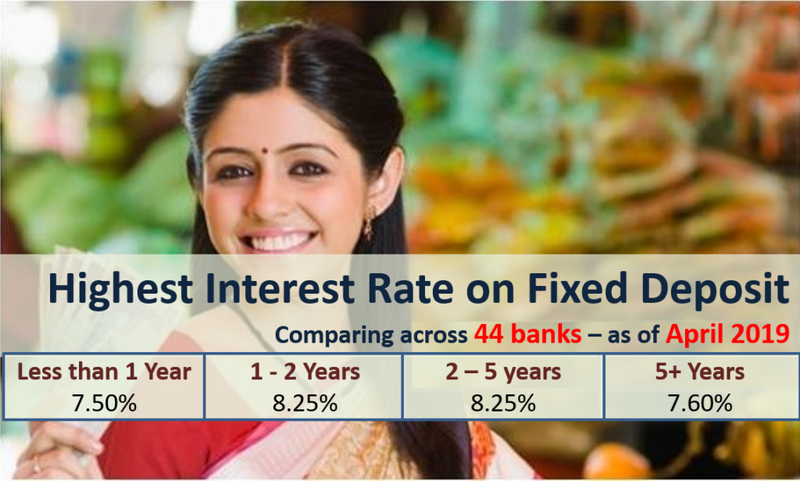 At the same time, Bandhan bank also gives 4.25% interest rates on savings account for less than 1 lakh balance and 6% interest rates on savings account for more than 1 lakh balance. Considering that I fall on highest tax bracket(30% slab) , I am wondering which of the below options I should choose to invest for 1 year ? Option 2 : Invest in an RD for 1 year by depositing every month around Rs 84,000 (= 10 lakh divided by 12 months). With option 2 , I would get same 8% interest rates from RD . Also I would get the benefit of 6% interest for keeping more than 1 lakh in savings a/c . Also there will be no tax upto Rs 10,000 on the savings a/c interest. I just need to pay the tax on interest of the RD amount. Can you please suggest which option I should choose . Please explain me with the calculation to understand better. Option 2: Keep money in savings account & do RD of 83,333 – You get Rs 44,141 in RD interest & Rs 27,500 in saving account interest. Taking Rs 10,000 as tax free on savings bank account interest, you should be left with Rs 52,594 after tax. So option 1 of doing complete FD at one go is still beneficial and simple. YOu must look at Arbitrage Mutual Fund as you are in 30% tax bracket. The returns are similar to 1 year FD and gains are tax free after 1 year and taxed at 15.45% in sold before 1 year. I have 1 lack rupees in my hand and planning to save for my Nephew (9 years old) for 5 to 10 years (need to get some high/better returns). Which one is better, FD/Mutual. Please guide me. If you are looking for NO risk guaranteed investment GO for fixed deposit. Hi amit i would like to save 4 lakh for 1 year and generate income for this amount every month for the next 1 year. what do you think will be the best deposit to pick? I had written about Investments to Generate Regular Income. Please check and choose investments best suited to your risk profile and needs. Let me know in case you have additional query. I have read all the blogs of you, it’s really very good, Kindly please suggest me, I was saving in smaller amount’s from my salary, Now they are seven lacks currently. my plan is to save for an House in future might be after six/seven years. Can you please suggest me where to Invest them to get more returns at the end ? or Can I get monthly interest amount from that seven lack’s if I invest in anywhere? Please suggest me there is no one to guide me, Please reply me, Thank you. If you are in 30% tax bracket you can go for debt oriented mutual funds. Alternatively you can invest in Company Fixed Deposits or buy NCD/Bonds of private companies when they are issued or from stock exchanges. Thank you so much Amit, I really appreciate you and your answers they are very very good.